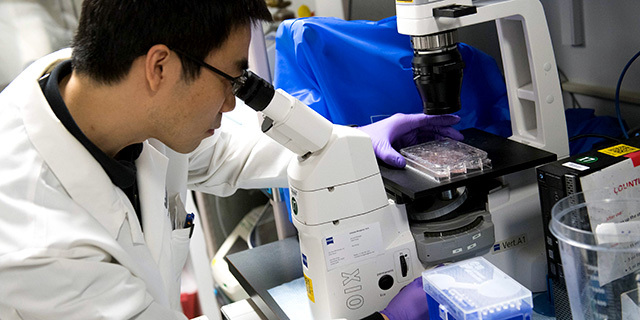 Americans are strongly supportive of the government investing in research in medicine and science, according to a new Pew Research Center survey. 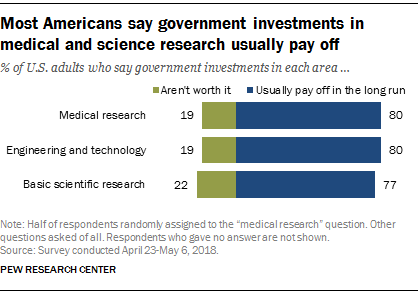 Around eight-in-ten U.S. adults say government investments in medical research (80%), engineering and technology (80%) or basic scientific research (77%) usually pay off in the long run. Only about two-in-ten believe government funding in each of these areas is not worth it (19% for medical research, 19% for engineering and technology and 22% for basic scientific research). A 2017 Pew Research Center survey found a wide and growing political divide over increasing federal spending on scientific research. Democrats and Democratic-leaning independents were 27 percentage points more likely than Republicans and Republican leaners to say they would increase spending on scientific research. 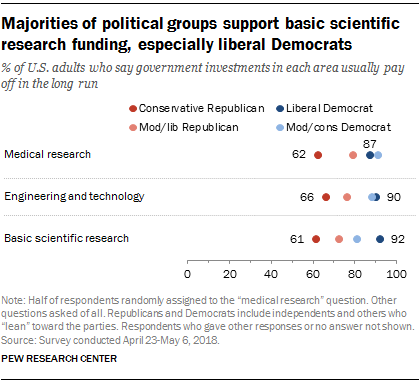 In 2001, by contrast, there was no significant divide between Republicans and Democrats over increasing federal spending for scientific research. The new survey also asked Americans to weigh the importance of government versus private investment in research funding. A majority of Americans (57%) say government funding is essential for scientific progress, while 42% say private funding will ensure enough progress even without government funding. The share saying government investment is essential is broadly consistent with previous Pew Research Center surveys that again used different survey methods and somewhat different question wording. Liberal Democrats and conservative Republicans have different views on this question. About eight-in-ten liberal Democrats (78%) say government funding of research is essential for scientific progress. 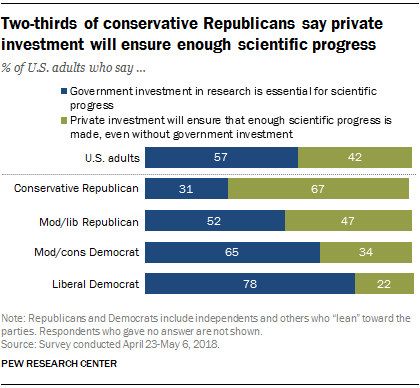 By contrast, 31% of conservative Republicans say government investment is essential, while two-thirds (67%) say private investment will ensure enough progress is made, even without government funding.